Adds link(s) after watcher names to directly call skype or slack or ms teams as needed (Anything that has a URI like sip:, skype:, mailto:, etc) - dynamically builds link for each user as specified in setups. Can be used to directly open Skype, or popup a screen, or open email etc as needed. 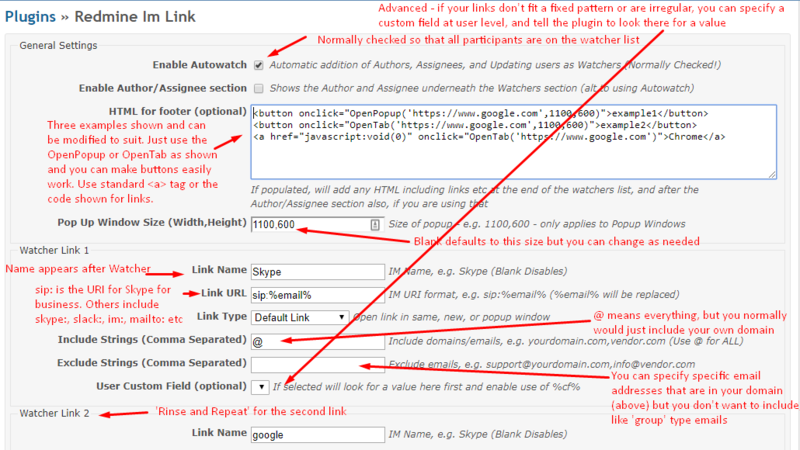 Also includes Autowatch functionality and ability to add links below watcher list. Substitutes user info on the URL mask like email, firstinitial, lastname etc. Adds ability to define links or other HTML after the watchers and Author/Assignee section if turned on including buttons, popups etc. Pull code from Github, place in plugins directory, bounce machine. Then you must check permissions and do some basic setup of the links that you want. Advise to start simple and test as there is a lot of ability to build links dynamically. Remember to set the permissions! Then go do your setups - start simple! Tested with 3+ and 4+. May work with others.